EPDM, age unknown. 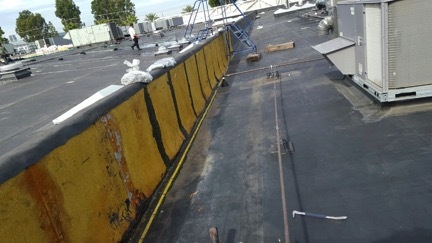 The roof surface was pin holing throughout and had over 100 roof leaks in 124,000 square feet, (1,240 squares). 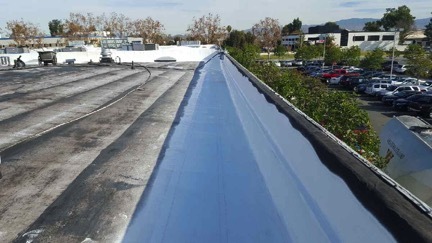 Originally the building owners thought that their only option was to tear off the EPDM and replace with a similar product. 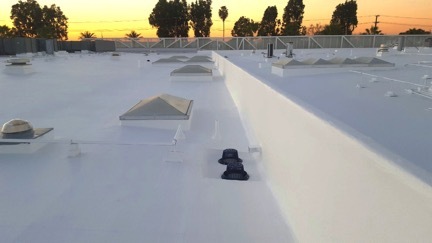 They hired a roof consultant who recommended Western Colloid’s Fluid Applied Reinforced Roofing as a solution. Western Colloid has systems that are fully tested and approved by FM for overlay installation over EPDM. 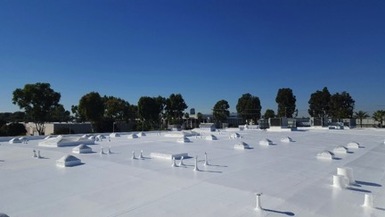 Western Colloid presented a specification that would eliminate the removal of the existing roof assemblies and save 30 – 40 % on the overall project costs by not removing the old roof and saved man-hours on the installation. Additionally future savings will be enjoyed with their now energy efficient white roof. 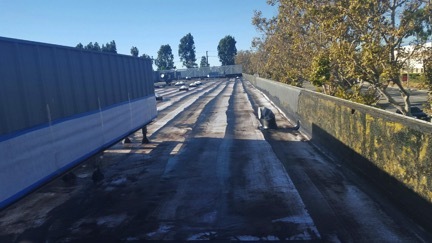 Pacific Dental avoided the disruption to their employees by a lengthily roof removal and re-installation plus the debris and landfill waste was at a minimum. 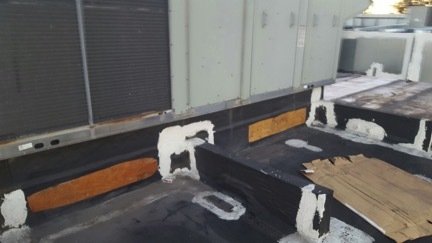 The Western Colloid specification allowed the contractor to use a temporary fix to stop the leaks with #800 Elastic Cement and polyester reinforcement. Then continuing with this extra layer of protection in the waterways and drains. Final installation steps included #298 asphalt emulsion with polyester reinforcement. Once cured, the system was surfaced with Western Colloid’s ElastaHyde acrylic coating. Pacific Dental Building with existing EPDM roof and buckling wall sheets. Embedded Polyester fabric in Emulsion. Top Coat of Elastahyde, including now repaired walls, creating a seamless surface.